Choosing your outsourcing partner? Think creatively and thoroughly. In this post i gathered some interesting facts about genius minds in Ukraine. 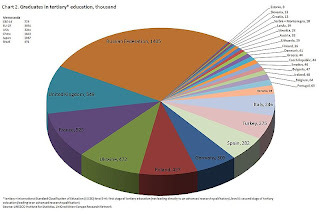 Ukraine produces the fourth largest number of academic graduates in Europe. In Ukraine, the number of higher educational institutions of III-IV accreditation levels is 315, including 223 state-owned ones, of which 41 is situated in Kharkiv. Ukraine is taking part in Bologna process. Results of participation of Ukrainian team in International Olympiad in Informatics. Ukrainian students took part in South-Eastern European Mathematics Olympiad for University Students with International Participation in 2008 and won 3 golden medals, 4 silver medals, 1 bronze medal. Ukraine won second place in 1st,5th, 7th, 8th, 9th International Scientific Olympiad on Mathematics, 5th place on 3rd International Scientific Olympiad on Mathematics. Ukrainian Team (from Lviv) occupied 4th place in ACM International Collegiate Programming Contest - 2008, sponsored by IBM (ACM-ICPC). As a conclusion, I would advise you to look for your business opportunities wherever possible, - for instance, when selecting your nearshore software development partner. Knowing facts, that your rivals don't know, will give you great competitive advantage.